Home to the National Opera of Belgium, this one of the most important opera houses in Europe. The building you see here today is the third theatre on the site. It was built in 1856; the first theatre was built in 1700. The architecture mixes a lot of styles on both the exterior on both the outside and the inside, such as Eclectic, Neo-Baroque, Neo-Rococo and Neo-Renaissance. Gilded surfaces, huge chandeliers, and the incredible dome painting known as ‘Belgium Protecting the Arts’ decorate the insides. Beautiful paintings and sculptures adorn the walls and hallways. The shows themselves are everything you can expect from a world class institution. No admission after show has started. Contact the organisation for possible guided tours. Prices depend on the show and location and can range from EUR 10 to EUR 130. 25% discounts for seniors, disabled and unemployed. Other last minute discounts may be available. Doors open 45 minutes before performance. Times given here are for the in-person box office. Actual hours depend on the show. One hour before show start. Closed on Sundays, apart from show start. Afternoon shows may start between 2:00pm and 3:00pm. Evening shows start between 6:30pm and 8:00pm. Tram 3, 4, 32 stop Bourse. 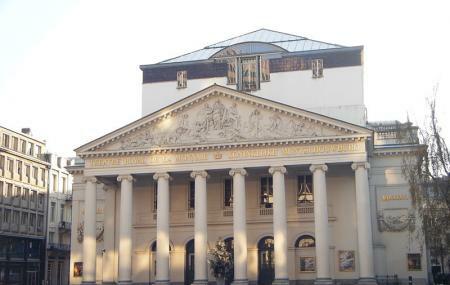 Small but trendy and very famous opera house of Brussels, known for showing operas that are less popular and almost unknown for most of the opera public. The exterior retains the classic architecture of the building, but the interior and specially the main concert room have been renovated with a more modern touch. Located in the downtown area, it also offers a lot of space on it's facade for public concerts and other activities like the Christmas market, using the front of the building a a stage. Very nice and old building. Great facilities, enough toilets for everyone. There is a obligated cloak room but you don't have to wait long for your items. Nice and kind staff. Only a bit pricey with the drinks. Really great building. Besides the great opera the building itself is worth a visit. I think my pictures are showing how great this is. And on top the staff was friendly. All service working well. I think if you have time then add this to your sightseeing visit in any case. Beautiful classical opera. The entrance is oddly modern but the ballroom is just beautiful. If you can, go visit the costume area, it's a great experience. Be careful with picking up the second row in the balconies... The view is very limited and you might have to stand up the whole show. But the place is gorgeous!